The Tokyo Gas Group has maintained energy infrastructures as a pioneer in the city gas business. We remain ever-sensitive to the demands and expectations of the public and steadfastly pursuing CSR activities to address social issues through business activities in Japan and abroad, as stated in the Group’s Basic Policy on CSR. 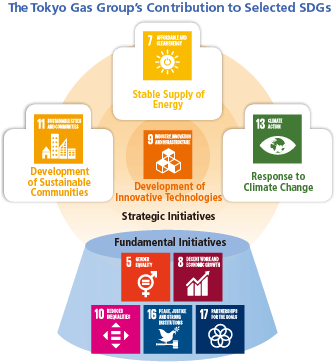 The United Nations adopted the Sustainable Development Goals (SDGs), which are based on an approach consistent with the Tokyo Gas Group’s Basic Policy on CSR. Confident that we can contribute to achieving the SDGs through the Group’s business activities, we have been reexamining the relationship of social issues to our operations in order to determine how to contribute to the SDGs in the context of our global business development. Specifically, as we strive to become a global total energy company, we will seek to facilitate the achievement of Goal 7 Affordable and Clean Energy by consistently expanding the use of natural gas and introducing renewable energy through our business energy, which we have cultivated over 130 years. A key requirement for supplying clean energy is the construction of a robust energy infrastructure. We therefore intend to contribute to Goal 9 Industry Innovation and Infrastructure by constructing highly reliable, disaster-resilient infrastructures and Goal 11 Sustainable Cities and Communities by developing sustainable communities based on highly efficient energy systems and services. By pursuing these initiatives, we will also focus on advancing the achievement of Goal 13 Climate Action. As part of its efforts to promote CSR, the Tokyo Gas Group will broaden employee awareness of SDGs, while continuously rising to the challenges posed by the SDGs toward achieving the sustainable development of society. As we strive to become a total energy company, we will focus on contributing to Goals 7, 9, 11 and 13 through our energy business. We will also promote fundamental initiatives for enhancing compliance, diversity, work style reform and other aspects in our efforts to achieve Goals 5, 8, 10, 16 and 17. The Sustainable Development Goals (SDGs) were adopted as long-term goals for the period from 2016 to 2030 by 193 member nations including Japan at the United Nations Headquarters in September 2015. The SDGs consist of 17 goals and 169 targets. The SDGs are based on the principle of realizing a world in which no one will be left behind, and companies as well as countries are expected to contribute their human resources, technologies and capital toward attaining this vision. In Japan, the cabinet decided to establish the Sustainable Development Goals Promotion Headquarters, headed by Prime Minister Abe, in 2016 and formulated a government-led action plan. 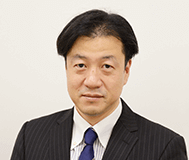 The Keidanren (Japan Business Federation) has also revised its Charter of Corporate Behavior to accomplish the goals and requires practical action from companies. To attain the global goals for creating a sustainable society, it is important to enhance energy security, improve energy efficiency and environmental friendliness, develop innovative systems and reduce costs. Smart energy networks (SENs), based on renewable energies, offer a solution for addressing these issues, and verification tests are currently underway in several regions and towns to realize this concept. The Tokyo Gas Group has spearheaded the initiative on SENs as a total energy company. Tokyo Gas constructs its smart energy systems around a combined heat and power (CHP) system in which heat and electricity are locally generated and consumed. The energy system is optimized to meet the needs of each community by linking heat, electricity and information in a single network, making maximum use of renewable and untapped energy and implementing energy management based on ICT. SEN is attracting significant attention as a standard for next-generation urban development that can improve energy efficiency, environmental friendliness and disaster resilience while also addressing social challenges at the community level. The northern district adjacent to the east exit of Japan Railway’s Tamachi Station is the site of offices, public facilities, hotels and hospitals amidst lush greenery. This is the Tamachi Smart Energy Park, built on the former site of Minato Ward’s public facility and our research facility under the concept of creating a disaster-resilient community with a low carbon footprint in a government-private sector initiative led by Tokyo Gas Engineering Solutions Corporation, a wholly-owned subsidiary of Tokyo Gas. The area is divided into the residential center zone (Block I) and the new city center zone (Block II) based on the Community Development Vision for the area formulated by the ward’s government in October 2007, and development has continued through various stages. The Smart Energy Center that supplies power to the Tamachi Smart Energy Park has adopted a cogeneration system that produces heat and electricity from clean city gas while making maximum use of renewable energy as well as untapped energy, a unique source of local energy. In specific terms, water heated by solar power is used as an energy source for air conditioning and water heaters. As for untapped energy, we utilize local underground tunnel water, which is maintained at steady temperatures throughout the year, as a source of heat and as cooling water to raise energy efficiency. 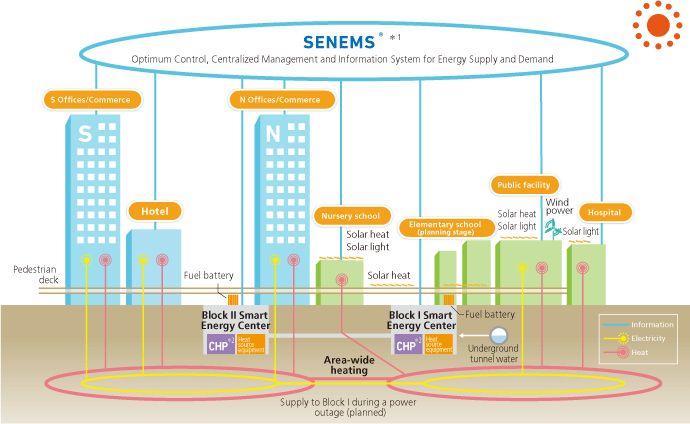 In addition, the Smart Energy Network Energy Management System (SENEMS®) serves as the control tower, providing centralized management over the energy needs and air conditioning systems of each building as well the energy supply and demand of the Smart Energy Center, thereby contributing to reducing energy consumption and CO2 emissions for the entire community. Even in times of disaster or emergencies such as power outages, cogeneration can secure a stable supply of heat and electricity. Plans are underway to further enhance energy security by constructing a backup system that will enable the two Smart Energy Centers to mutually supply heat and electricity in the event of a shortage in either Block I or Block II. Smart Energy Networks not only offer direct benefits related to energy, such as cutting utility costs, but also generate added value from environmental, social and economic perspectives. This locally generated value has particular relevance to six of the 17 SDGs, and Tokyo Gas will seek to help achieve these six goals by providing SENs as a total energy company. 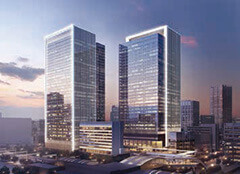 From the planning stages of new SEN projects to construction, I am responsible for project management. SENs offer low carbon footprints and high resilience to disasters, which can revitalize a community and enable us to support the energy aspects of developing attractive communities that society needs and to contribute to the achievement of the SDGs. My work is highly rewarding. SENs involve the use of new technologies and unconventional methods, so it is important to enable our customers, designers, contractors and others involved in the project to fully understand the concept and realize its value. For this reason, we always begin the construction of an SEN by forming an SEN Working Group for all concerned in each project and proceed by building consensus. In communities where SENs have already been constructed, such as in Tamachi and Kiyohara, the recognition we gain from community residents and people in neighboring areas will lead to further expanding the SEN. We will continue to develop good partnerships with everyone involved through community development, emphasizing the diverse benefits an SEN delivers in terms of local environmental, social and economic aspects, and thereby contribute in various ways to achieving the SDGs. We have recently noted a rising number of collaborations between companies and local governments to meet social challenges by concluding comprehensive partnership agreements. While local communities face diverse issues, expectations have been rising for the roles that companies can play in building a sustainable society, which in turn requires that they demonstrate their capacity to take action and show solid results. The Tokyo Gas Group has consistently contributed to developing communities by fully utilizing local characteristics at each base of its operations. In March 2018, we concluded a comprehensive partnership agreement with Tsukuba City to pursue collaborative projects in six areas. This is the third city with which the Tokyo Gas Group has signed a comprehensive partnership agreement, following Fujisawa City in Kanagawa Prefecture and Kokubunji City in Tokyo. Since it supplied gas through the former Tsukuba Gakuen Gas Corporation, the Tokyo Gas Group has collaborated with Tsukuba City on various projects, including environmental protection and disaster prevention. 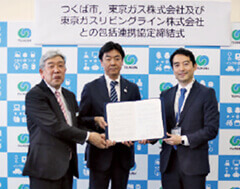 The comprehensive partnership agreement concluded among Tsukuba City, the Tsukuba Branch Office of Tokyo and ENESTA Tsukuba (Tokyo Gas Livingline Co., Ltd.) on March 28, 2018, confirmed that the parties will seek to revitalize the community and enhance public services in the following areas: (1) environmental protection, (2) education, (3) creation of an inclusive society, (4) disaster prevention and countermeasures, (5) improvement of physical health and promotion of sports, and (6) development of a sustainable community by revitalizing the local community and enhancing public services. We have launched a new project under this agreement in which we will apply the Group’s expertise to community development. During the signing ceremony at the Tsukuba City Hall, Mayor Tatsuo Igarashi expressed his belief that incorporating the SDG perspective into the latest agreement will create a model for future comprehensive partnership agreements. Several factors led to this latest agreement prior to the ceremony. On February 19, Tsukuba City announced its Vision for a Sustainable City, which incorporates the SDGs, and the Tsukuba City Council passed a resolution during its regular March session calling for initiatives aimed at reflecting the SDG principles in the Tsukuba City administration. Moreover, the inclusive spirit of “leaving no one behind” as the basic principle of the SDGs is consistent with Tsukuba’s vision of developing a sustainable community and closely aligns with the Tokyo Gas Group’s stance of addressing social issues through its business. Going forward we will help revitalize the local community and create an inclusive society by effectively utilizing the Tokyo Gas Group’s know-how and programs related to the environment, disaster prevention and health in order to develop projects for creating an inclusive society. These would include offering opportunities to experience para sports, projects for improving health and environmental education seminars. Since the days of the former Tsukuba Gakuen Gas Corporation, Tokyo Gas has worked with Tsukuba City to pursue local development activities as a company closely attuned to local needs. To further bolster our collaboration toward our goal of developing a sustainable community, a comprehensive partnership agreement was concluded among Tsukuba City, Tokyo Gas and Tokyo Gas Livingline on March 28, 2018. Under the agreement, we plan to revitalize the local community and enhance our public service by drawing from the Tokyo Gas Group’s track record in the environment and health improvement as well as its expertise on popularizing para sports. In June, Tsukuba City was selected as a “FutureCity” under an SDG initiative of the Japanese government, which recognized the city for its stance on developing a sustainable community in collaboration with various stakeholders, including private companies such as Tokyo Gas. 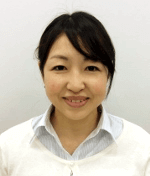 Looking ahead, Tsukuba City will promote pioneering initiatives for attaining the SDGs. Sustainable community development cannot be accomplished by municipal governments alone; it requires involving companies, organizations and individuals in initiatives that engage the entire community. To do that, we will start by raising citizen understanding of SDGs by taking advantage of our latest comprehensive partnership agreement.